Not all our readers have met us face to face yet, so we carry on with the interviews introducing our Brno Expat Centre crew. Our lead consultant, Tomáš, is a law school graduate and a clerk of the public defender of rights. 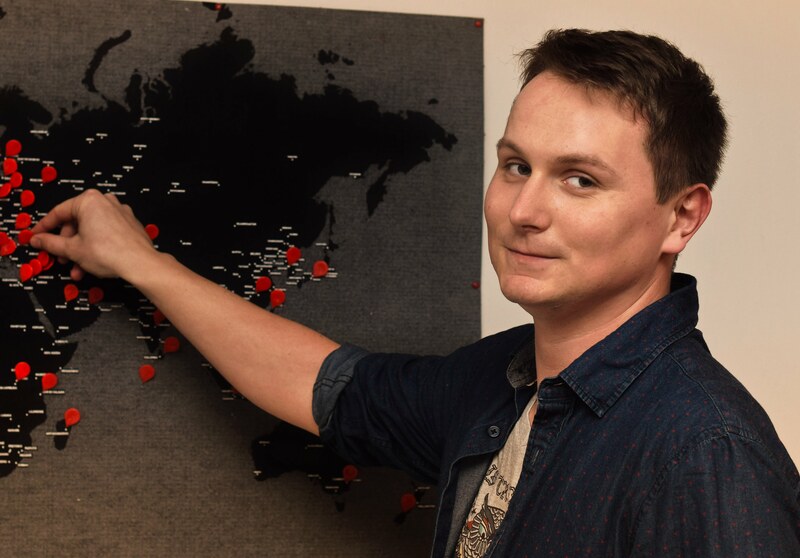 He joined the BEC team in June 2017 and has readily helped hundreds of Brno expats since – keeping his famous cool throughout the whole time. Have you always lived in Brno? What do you like the most about living here? I’ve been in Brno for eight years or so, from 2009, moving here for a hospitality management school and then staying to study law. I come from a small village in the countryside, in the Beskydy mountains. I like that the city is very small. You can get anywhere in just a couple of minutes. The public transport and the city infrastructure is very good: you can get to the centre in a few minutes from any side of the city. Yes, I stayed in Manchester, UK, for seven months. I was working as a waiter in a restaurant at the Trafford centre, which was at that point the largest shopping centre in Europe. My decision to go to England was a spontaneous one – I was on a plane two days later. I wasn’t prepared at all; I didn’t know how to get a social security number or how to open an account. I was lucky I found a local guy willing to help me – a landlord renting flats to Slovaks and Czechs, and helping them at the start. Looking back, I see how essential his support was for me. You started working for the BEC just before your graduation. What brought you here? I was working at the office of the public defender of rights – I still am. My superior knew Jan Kopkáš (BEC executive manager) and she told me they were looking for a new consultant. I applied, and I got the job. I was working with foreigners before: providing legal help at the detention centre not far from Brno. But my job back then was very different from what I do now: I dealt mostly with asylum law. Whilst at BEC I still deal with immigration but outside of the asylum law. That I don’t need to wear a suit. Apart from that, the end result is the best: when you can see – sometimes even immediately – that you have really helped someone. I was helping people when working with the defender of rights, as well; however, it takes quite a bit of time to see any results there and sometimes you don’t get to see any at all. Also, I hope we are working to make an improvement here in Brno, to set up good practice with the public authorities so one day we might not be needed anymore – so, if we are successful, I’ll get myself fired. Which part is the most annoying? Where can I begin? No, it’s not a long list – only people who don’t follow clear instructions that we are trying to provide, especially when it comes to visits to the Immigration office. You are dealing with public offices almost every day. What would you say to people who complain to have to visit once a year? They are right to complain. Not all the offices are troublesome, but it is not a pleasant experience in general. The clerks are not interested in doing something extra – which speaking in English is in their eyes. Even when I’m there to translate, they are still not excited to see a foreigner. However, it is their job to try to resolve an issue from anyone who comes. What do you enjoy doing after work in Brno? I like to go hiking or going for trips – to Moravský kras, for example. It’s very easy to go hiking around Brno: one bus or train ride takes you straight to nature. I like summers in Brno: it is really quiet – all students have left. I play board games, and like to play video games, as well – I grew up in one of the first computer generations and now it’s a part of me. I still find it relaxing and amusing. I enjoy going to Brno’s pubs; my favourite one is Na Stojáka. Their crown beer is brewed in Ostravice, a small town in the mountains where my family comes from. I know the brewers. I like the beers there and the way they draft them. It’s very nice when you go there in summer, when it’s warm and you can stand outside with another hundred or so of people, and watch some known Brno characters singing and dancing for a cigarette.